There is much wisdom in ancient teachings. As I spend more and more time and energy reaching out to those in need or helping others reach for the stars, I am also presented with opportunities to learn from the teachings of the ancient elders. Mother Teresa is one of those who carried forward the teachings of the ancients into current time. She taught us the true meaning of love and service. She inspires me. Gandhi taught us to “Be the change we wish to see.” Wayne Dyer taught us to take responsibility for our own thoughts, actions and reactions. I could go on and on. Each of these wise teachers are reminding us of the wisdom of the elders. It’s not new news. It’s all ancient teachings. But who brings them forward? Another great ancient teaching is the Hawaiian Healing Prayer, Ho’Oponopono. It means – to make right. It’s so simple it’s difficult for our ego mind to believe it could possible work to help heal anything. Yet, it does. From injuries to relationships! It’s like a miracle worker. Why? Because it combines the power of love and forgiveness. There are only four steps. They are laid out in four simple statements which connect to deeply held beliefs or emotions. Step One: Acknowledge and Repentance. I AM SORRY. We are completely and totally responsible for our actions and reactions! We choose them. You may be sorry for being angry or for hurting someone’s feelings. You may be sorry you gained weight or were careless and hurt yourself. The list goes on and on. Even if you are not quite sure if you are “sorry” for something, say it anyway and see what happens. Step Three: Gratitude. THANK YOU. Again, this is not about going to another human and expressing the gratitude. Express gratitude to yourself for yourself. Just say it! Thank Spirit. It doesn’t matter to whom… just express the gratitude! Say Thank You! Step Four: Love. I LOVE YOU. Share the love. Love for yourself. Love for others. Love for Spirit. Love for humanity. Just share LOVE! These four simple statements become four incredibly profound expressions of love and service to self and to others. Easy and effective. 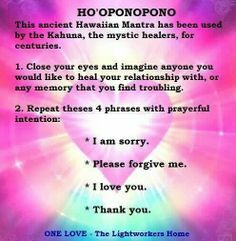 No one ever need to know you are using the Ho’Oponopono to help heal yourself or a relationship. Dr. Ihaleakala Hew Len used this method to heal criminally insane patients he had never met. He read their patient files and performed this healing ritual for each of them. The results were incredible! It is my understanding this healing works regardless of the order of the statements said. It is more important that we acknowledge each step and use the verbiage to clear the energy connected to it. The order of the statements matters less than the awareness of them. So, put on your thinking caps and start a list. Do you have physical issues your need to heal? How about: Relationships with others; your finances; your health; your feelings about yourself; your feelings about others; your prejudices; your anger/hurt/hatred… Get started now making miracles happen in your life and allow the ripple effect of your Ho’Oponopono to happen!